Having given a brief résumé of my father’s relations it is time to go back to the early part of his life as a boy, which is a bit sketchy dependent upon some of the exploits he was boy-like guilty of. But for all that, was no doubt fairly mundane by comparison with the activities of children these days. One episode he recalled and described concerned a goat that was owned by some member of the staff on Mt Victoria signal station. He, plus some mates, managed to get the goat into an open-ended barrel which they launched off down the hill, the animal being flung out en route to the bottom. Eventually entry to manhood at 13 years of age. Leaving school while only in Standard 3 was regarded as of little consequence and fitting the requirement of his father to assume the mantle of providing for his family and his son’s allotment to that status. I am none too sure of the state of the economy of the country during this period, suffice it to be said that so far as the poor and needy were concerned life generally was no bed of roses, and the Welfare State undreamt of at the birth of the 20th Century. Charles obtained work with the Melanesian Bible Society Mission whose works in and around the Islands of Melanesia needed to be served by sea, and to this end employed a small barkentine named Southern Cross that subsequently was sold to private interests and named Ysabel. As far as I know the Ysabel was then in New Zealand ownership in the year 1891 and trading throughout the South West Pacific, but there seems to be a period in Charles Daniel’s time when he said he had left school at age 13 that is unaccounted for till he joined the Ysabel as a boy, giving his age as 16 which agrees with his birth date of 1883. Charles at about 16 years of age. Just what he did during the years of 1896 or 1897 till he reached the age of 16 in 1899 when his discharge shows he joined the Southern Cross as a boy on the 1st of April 1899, and was discharged on the 10th of July 1899, at Auckland, I do not know. I have a faint recollection he was possibly working at labouring work, maybe where his father was employed, but no doubt he would have been conversant with the local maritime activities around the Devonport area where the family lived. So perhaps getting work as a seaman was preferable to what may have been available ashore. Anyhow, it was the first step in a chosen occupation by contrast as we find him back in Auckland after a trip to the Solomon Islands Group in the Ysabel as a boy. He also contracted a dose of malaria which periodically had him seeking relief by dosing himself with quinine, in which he had implicit faith. His next ship was, according to his discharge, a small barque of 570 tons called the Wenona in the Intercolonial Trade. It shows the place of engagement as Melbourne on 1 August 1899, and place of discharge as Melbourne on 28 October 1899 as rating of Boy, so he must have joined the Wenona in Auckland. According to the information on the discharge there is a note in the hand-writing of the Master which is attached to the discharge that moves him, Charles Daniel boy, up to O.S. or “ordinary seaman” and dated December 29, 1899, signed by the Master J.J. Johnson at Kaipara. 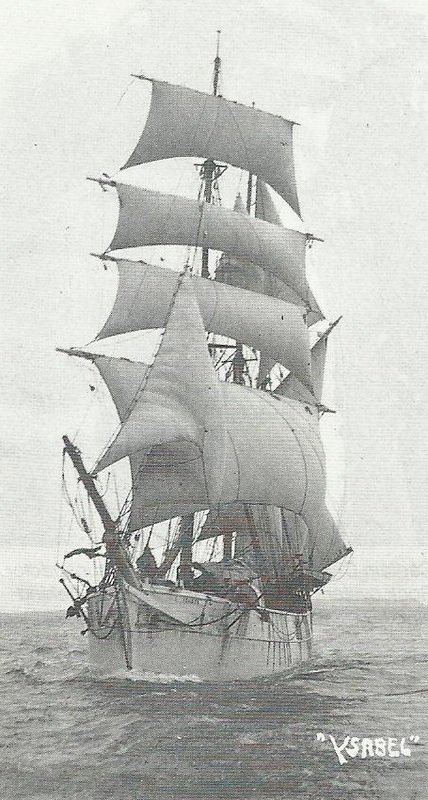 On 2 February 1900 Charles Daniel joins a British barque, Star of the East, 1757 tons from London, as an O.S. in Auckland. This was bound for New York and return to New Zealand where he got his discharge on 8 June 1900, Geo. N.Rodgers Master. He stayed by the ship which must have discharged and loaded to return via Cape Horn once again to New York. Apparently he thought better of a return to that port, based on his experience in passing this dreaded Cape on the previous voyage, and he did tell me of trials of that passage and also of the attitude of the people he met ashore in the vicinity of the East River and Brooklyn. The Star of the East cleared Auckland but came to anchor in Rangitoto Channel waiting on a slant in the weather to get a fair wind out of the Gulf. Whether he got homesick, and he did have qualms about a passage in the middle of winter around the Horn, he decided to quit the ship. Nothing loath he dived overboard whilst he was on anchor-watch and swam ashore somewhere near Cheltenham Beach and went to his parents’ home on the Shore. Having deserted the ship he could not seek ship employment in the Auckland region, so he walked or got to Thames where he would arouse no suspicions and got a berth as AB in a barkentine of 484 tons, the Margarita, and did two trips in her Intercolonial, William Heagler master. His last ship Intercolonial was a 700 ton small barque called the Woosung after which he concentrated on coastal ships, becoming mate and ultimately master. He obtained his ticket as Home Trade master No.5534 issued on January 29th 1906, aged 22, his 23rd birthday would occur on 6th July 1906. The advent to master status was attributable to his ability at his chosen craft and the regard with which his presence, his honesty, reliability and character exhibited as boy O.S. A.B. mate. The Marine Department Annual Report from 1904-5 lists Charles as having obtained the rank of “Mate – Home Trade” on the 24th January1905 certificate number 5534. This was then upgraded a year later to “Master – Home Trade” in the Marine Department Annual Report 1905-6. It must have been obvious to him, and this is surmise, that the day of the wind-driven ships had passed its zenith and must decline in giving way to steam which was a feature dictated by economics that was to hasten that decline. I believe it is worth recording for those who follow this narrative that Charles Daniel assumes for the purpose of clarity the sobriquet of The Captain when in reference to him, a matter I had adopted that left little doubt as to his status and also used by others. At the conclusion of his Trans-Tasman days and its ships his records disclose those coastal ships, sail and steam, in which he served time. ss Stella, ss Hawea, ss Young Bungaree, ss Wairoa, ss Lyttleton, ss Clematis, ss Ohinemuri. Then in sail in scows, The Welcome, Tramp, Seagull, Rambler and Ranger. Prior to this episode, we have got a little ahead of proceedings re the Captain’s history so it may be more in sequence to note some of the other happenings, one of which I have already written about and which P.A. Eaddy, a later-day scowman, was also author to in his book “Neath Swaying Spars”. The article I wrote for the local paper was entitled “Storm at Sea”, however, Perc Eaddy’s book is considered a classic as it’s written by a man who served time at sea as a sailor-man in scows. This book was published by Whitcombe & Tombs Ltd and appeared for sale at the lowly price of 4 shillings and sixpence (4/6d). It has long been out of print and my copy is an original and had been given to Capt. Daniel by Mr P. Eaddy and autographed by him on one of the front pages in 1939. It must be clear that for an author who knew what he was writing about to get the princely sum of 4/6d, he stood a very good chance of bankruptcy if he was to be dependent on his pen to earn a living. At the time of this incident Perc Eaddy lived at the entrance to the Panmure Basin near the neck, and about that time, 1926, he had a 16 foot centre-board yacht and my brother Jim and I became, for a time, forward hands with him in sailing this boat at the weekends. After the stranding of the Tramp in June 1907 (26th June), Capt. Daniel, once ashore, went overland into the southern reach of the Kaipara for assistance, leaving by the ship the four crew, a cat, dog and pig. The Tramp was refloated by the crew and master, who at the time was employed by the Ford Shipping Line in a number of their other ships as the discharges show. Sometime later the Captain was master in another Ford Line scow, the Ranger, in the salvage of the small barque Wai Iti which capsized whilst moored to a jetty at Maungwhare on the Northern Wairoa River. About this time W.Browne of Te Koporu, a ship builder, had the contract to right the barque, i.e. “get her back on her feet”. Also engaged on this task were some of the Rope brothers, all shipwrights in Browne’s employ. The Rope Brothers were later to employ Barney Daniel – Captain Charles Daniel’s eldest son and author of this book. By this time Capt. Daniel was still in scows and was contemplating marriage to my mother Ida Isabelle Stanaway of Aratapu, aged 25 at the time. They were married in the Church of the Holy Street Sepulchre in Khyber Pass Auckland on 7 August 1910, by which time those of her family, and there were 13, had all gone their ways to different situations, but leaving the grandparents at 69 Symonds Street Auckland. 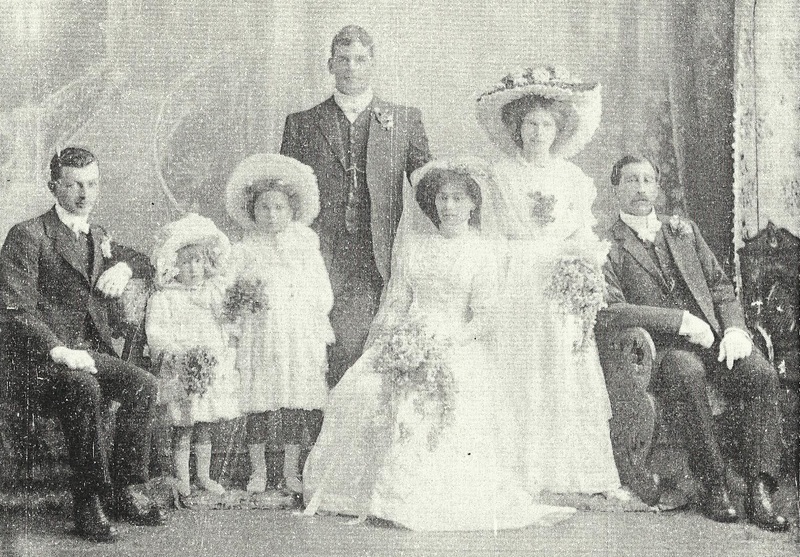 Wedding Day 7 August 1910, Unknown groomsman, Lesile Stanaway, unknown flower girl, Charles, Ida, unknown bridesmaid and John James (Jack) Stanaway (Ida’s brother). Marriage Certificate number 1910/3945. She is listed as a Music Teacher and Charles as a Master Mariner. They then reside with her parents at 69 Symonds Street, Auckland. 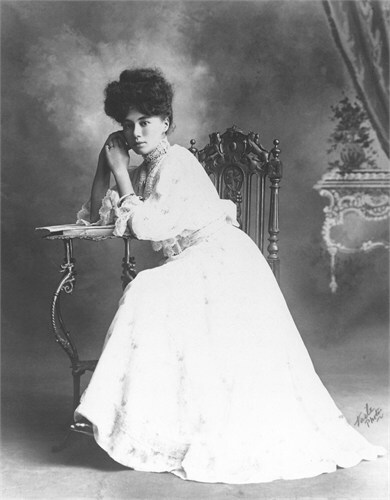 Ida Stanaway aged about 20. Ida Isabel was born on 7 August 1885 (birth certificate number 1884/066597) in Aratapu in the northern Kaipara region. 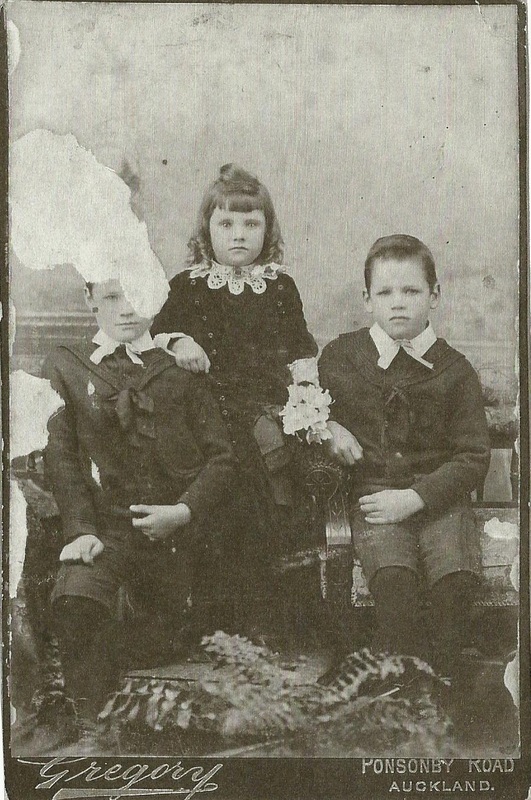 Her parents were William and Susan Stanaway – they had a total of 14 children, with Ida being the tenth. 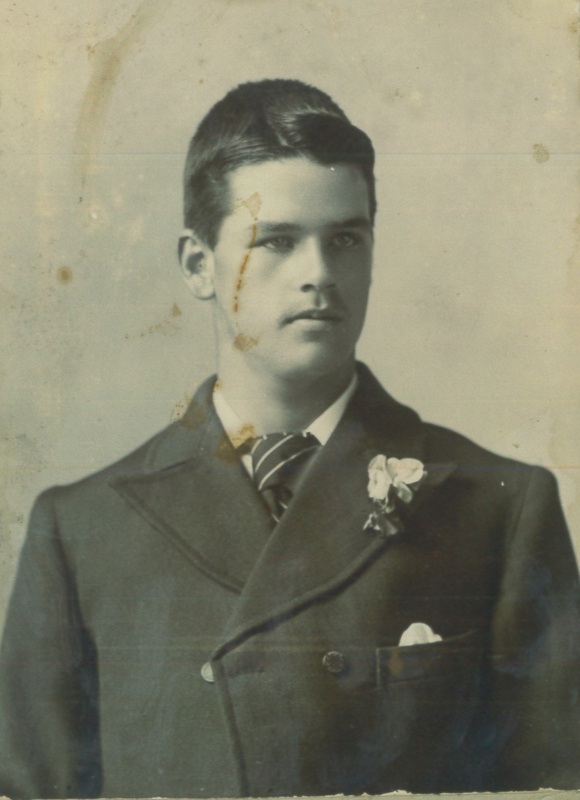 Both Ida’s father, William Stanaway and grandfather Captain JJ Stanaway were Mariners in their own right. Most notably William’s father was Captain JJ Stanaway – Harbour Master and Pilot in the Kaipara Harbour. Much of her early childhood is unknown other than she did learn to play the piano and well enough to become a teacher of the piano. 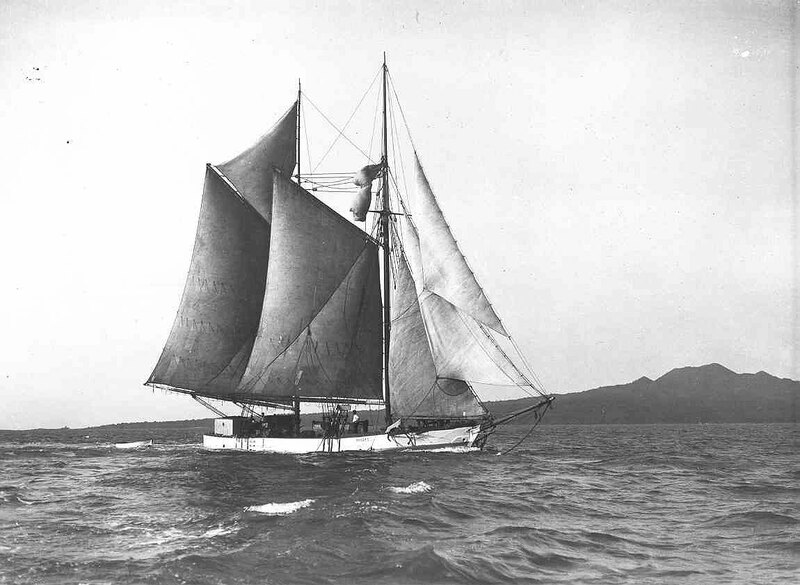 By 1909 she had caught the eye of a young sea captain, Charles, who at the time was sailing up and down the west coast between the Hokianga and Manukau harbours stopping in at Kaipara moving milled timber and other goods. Auckland Star 28 December 1910. Charles Bamford Daniel was charged with having been disorderly while drunk in Symonds Street, with having used obscene language, and with having resisted Constable Reilly in the execution of his duty. The police gave accused as excellent character. He was convicted on the three charges, and fined £2. My first breath of life was at 69 Symonds Street in Auckland, according to my mother at 8 o’clock in the evening of the 21st of May, 1911. I gave my mother (her first) a terrible time being 10lbs of red-faced blubber and she only a tiny woman. 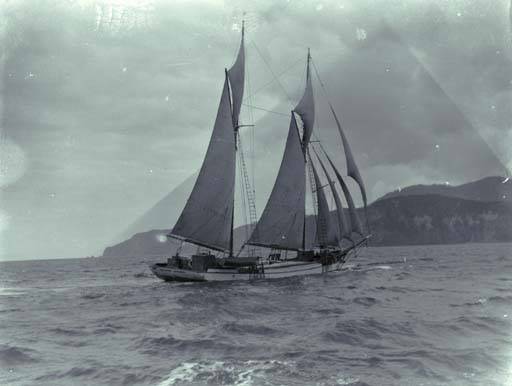 There is a letter amongst my papers verifying this, written by my mother in pencil and addressed to her husband, my father, at that time loading sawn timber from the mill at Mercury Bay into the scow The Rambler, of which he was Master. 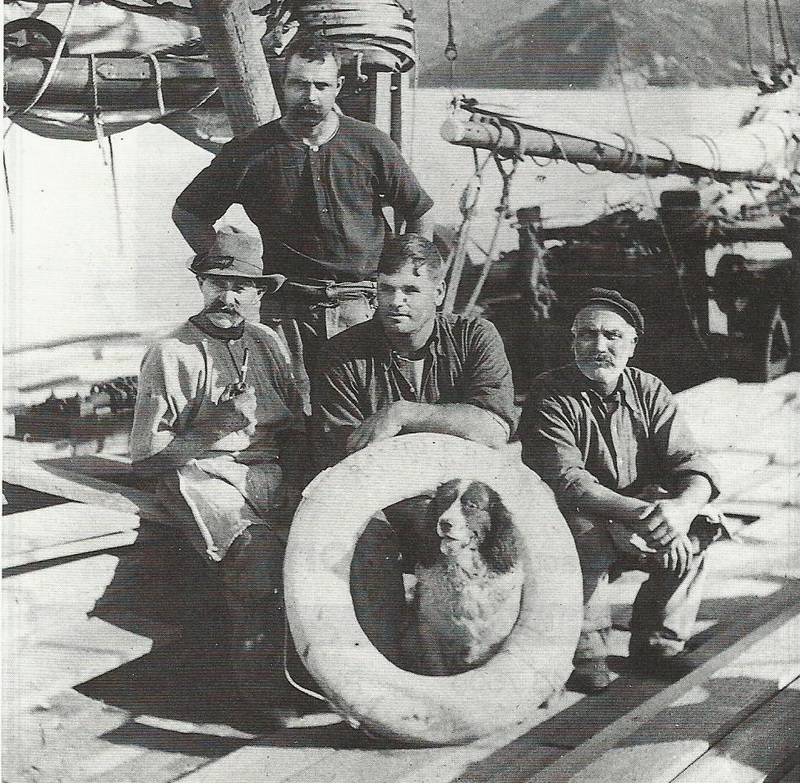 Charles with the crew (including Rags the dog) on the scow “The Rambler”, about the time of Barney’s birth. Later I was told about this and on record is a letter addressed to Capt. Charles Daniel of the scow The Rambler Whitianga, Mercury Bay, where it was being loaded with kauri timber (sawn) for Auckland. I am none too sure but the days of Capt. Daniel’s voyaging in scows around the coast were drawing to a close, and whether my mother had put her foot down I do not know but it was obvious to the Captain that as there was a strong possibility of the family increasing more settled a regime was looming up as another child was expected. Mother incidentally was living with her parents at the address above and I imagine at that stage for the reason that her husband was away so often found this convenient. For the next 18 months I continued to thrive but memory does not stretch that far into the past to recall much about it. It may be as well to fill in a few details of the union whereof I became the first issue.